Updated: 20 Ramadan 1433H / 9th August 2012M, Kh. 5 Ramadan 1433H / 24th July 2012M, Ra. Assalamualaikum. 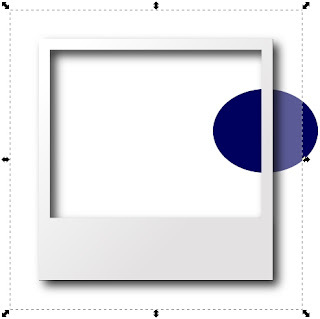 This was an attempt to create a vector Polaroid frame using the Inkscape Vector Graphics Editor software. The results are shown in Pic 1, Pic 2 and Pic 3. 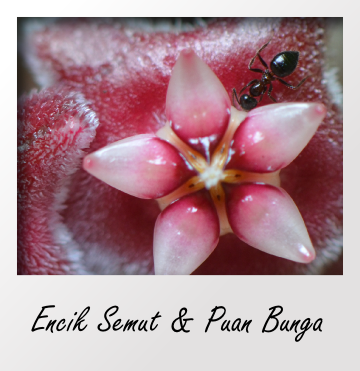 Pic 1 - Refer to Step D. Bunga-1. 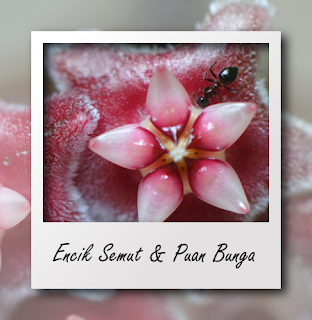 Encik Semut & Puan Bunga = Mr. Ant & Mrs. Flower. Polaroid frame + outside Polaroid frame + drop shadow. Pic 2 - Refer to Step E. Bunga-2. Polaroid frame -- outside Polaroid frame + drop shadow. Pic 3 - Refer to Step F. Bunga-3. Polaroid frame -- outside Polaroid frame -- drop shadow. 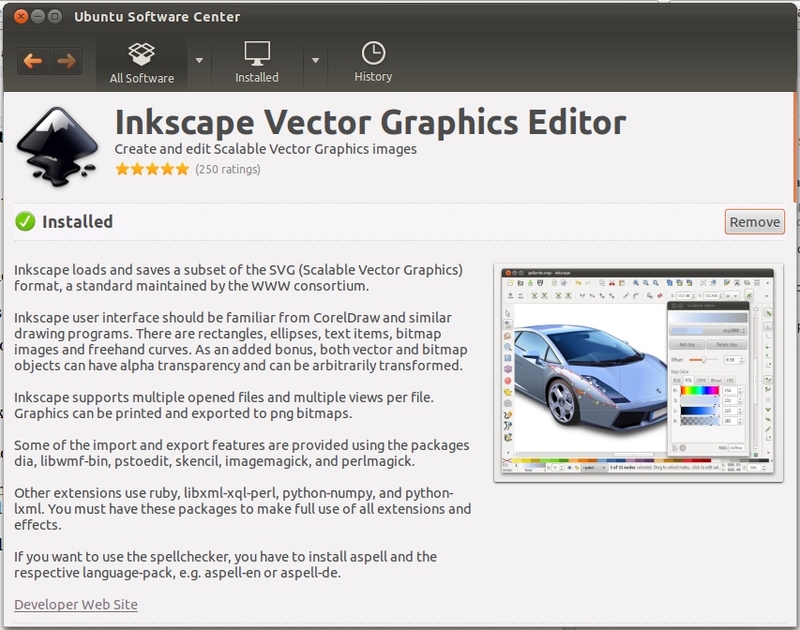 Pic 4 - More info on the Inkscape Vector Graphics Editor package as shown in Ubuntu Software Center. The search results will auto-filter as you type. See Pic 5. 3. 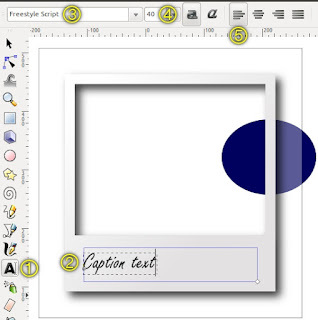 Click on the Inkscape Vector Graphics Editor package. Two buttons will appear, the More Info button and the Install button. See Pic 5. To read more about the package and the available add-ons, click the More Info button. When ready to install, click the Install button. To install straightaway, click the Install button. Pic 5 - Refer to Step 3. 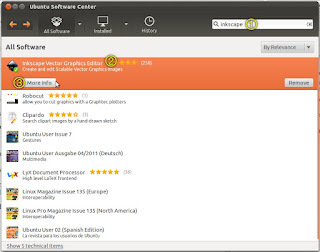 Searching for the Inkscape package in Ubuntu Software Center. 4. The Authenticate window will appear prompting for your password to authenticate the installation action. Type-in your password in the Password field, then click the Authenticate button. Depending on your Internet connection, allow time for the package to be downloaded then installed into your system. Pic 6 - Refer to Step 4. Authenticating the installation of the Inkscape package. 5. 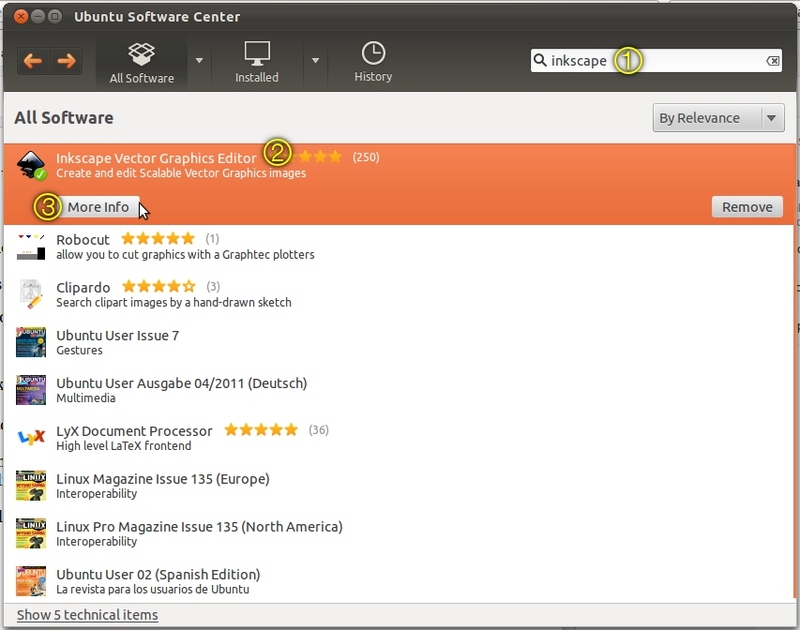 The Ubuntu Software Center window can be closed once the installation process is completed. 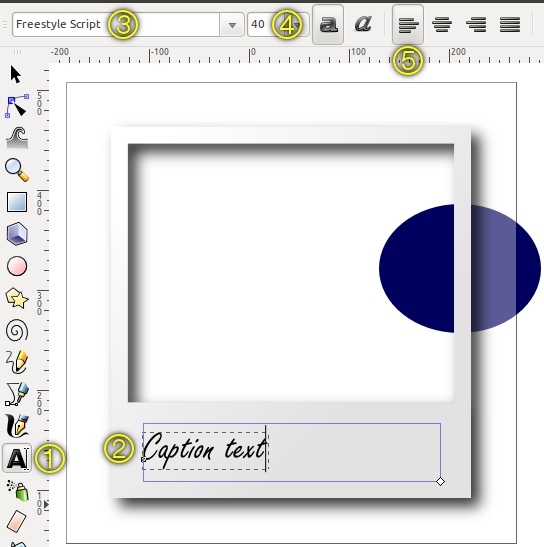 Pic 7 - Screenshot of the Inkscape Vector Graphics Editor software. 6. 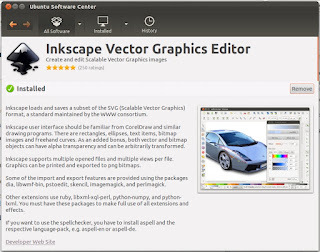 Run Inkscape Vector Graphics Editor. 7. To set the canvas size, go to File > Document Properties... . See Pic 8. The Document Properties (Shift+Ctrl+D) window will appear. See Pic 9. At 100% zoom, the canvas will look like Pic 10. Pic 8 - Refer to Step 7. Accessing the Document Properties (Shift+Ctrl+D) window. Pic 9 - Refer to Step 7. Setting the size of the canvas. Pic 10 - Refer to Step 7. The canvas with the new measurements. Compare canvas shape with Pic 7. 8. Save the work by clicking File > Save As... . The Select file to save to window will appear. See Pic 11. Give the file a name in the Name field. Make sure the format for the file is Inkscape SVG (*.svg). For the succeeding saves, use File > Save or simply use the Ctrl+S keyboard shortcut. Make saving your work frequently a habit. The easiest is to save after completing each Step -- right before proceeding to the next Step. Pic 11 - Refer to Step 8. Saving the file for the first time. 9. By default, the current layer you see on the canvas is named Layer 1. Lets rename this layer. 9.1. Click Layer > Layers... . See Pic 12. 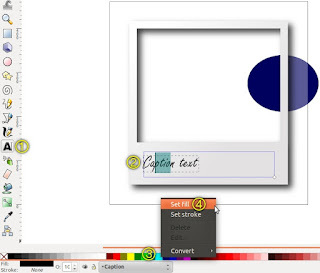 The Layers (Shift+Ctrl+L) dialog, see Pic 13, will appear on the right-hand side of the Inkscape window. Pic 12 - Refer to Step 9. Accessing the Layers (Shift+Ctrl+L) dialog. Pic 13 - Refer to Step 9.1. The Layers (Shift+Ctrl+L) dialog. 9.2. 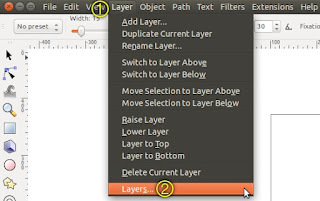 In the Layers (Shift+Ctrl+L) dialog, right-click the layer that needs to be renamed. In the right-click menu select the Rename Layer... . See Pic 14. The Rename Layer window will appear. See Pic 15. Pic 14 - Refer to Step 9.2. Right-click menu. Change the Layer name from Layer 1 to Background. Then click the Rename button. Pic 15 - Refer to Step 9.3. The Rename Layer window. 9.5. 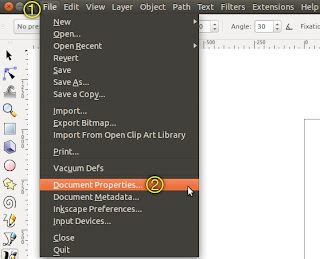 In the Layers (Shift+Ctrl+L) dialog, see Pic 13, simply click on the layer's name to rename. Press the Enter button or click anywhere to accept the name change. Press the Esc button to cancel the change. 9.6. To rename the currently active layer, go to Layer > Rename Layer... . See Pic 16. Pic 16 - Refer to Step 9.6. Accessing the Rename Layer window. 9.7. The Rename Layer window will appear. See Pic 17. Pic 17 - Refer to Step 9.7. The Rename Layer window. 10. Creating the Polaroid frame. 10.1. Create a new layer by clicking Layer > Add Layer... . See Pic 18. The Add Layer window will appear. See Pic 19. 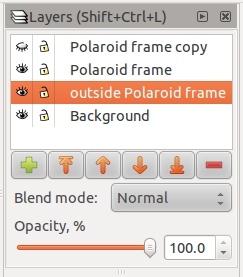 Name the layer as Polaroid frame in the Layer name field. Make sure the new layer is Above current in the Position field. Pic 18 - Refer to Step 10.1. Accessing the Add Layer window. Pic 19 - Refer to Step 10.1. The Add Layer window. 10.2. 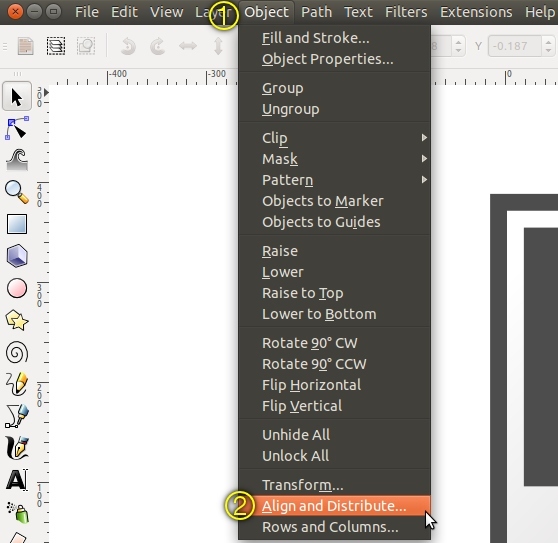 Click the Rectangle tool icon in the left-hand side vertical toolbar. See Pic 20. 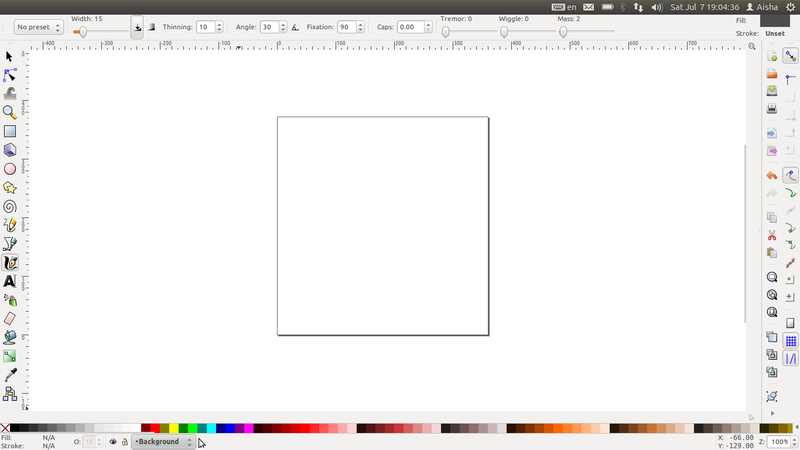 Create a rectangle on the canvas. I'll refer to this rectangle as Rectangle-1. See Pic 22. 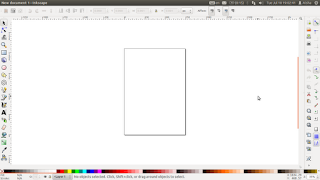 Use the the Controls bar (the horizontal toolbar at the top of the Inkscape window) to set the dimensions of the Rectangle-1. Make sure the padlock is unlocked. Pic 20 - Refer to Step 10.2. The Rectangle tool icon in the left-hand side toolbar. Pic 21 - Refer to Step 10.2. The dimensions of Rectangle-1. 11. To give Rectangle-1 some color make sure the Polaroid frame layer is active. 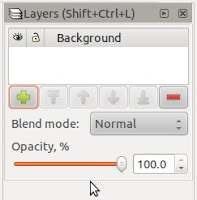 Check the Layers (Shift+Ctrl+L) dialog. 11.1. Right-click Rectangle-1. In the right-click menu, select the Fill and Stroke. See Pic 22. 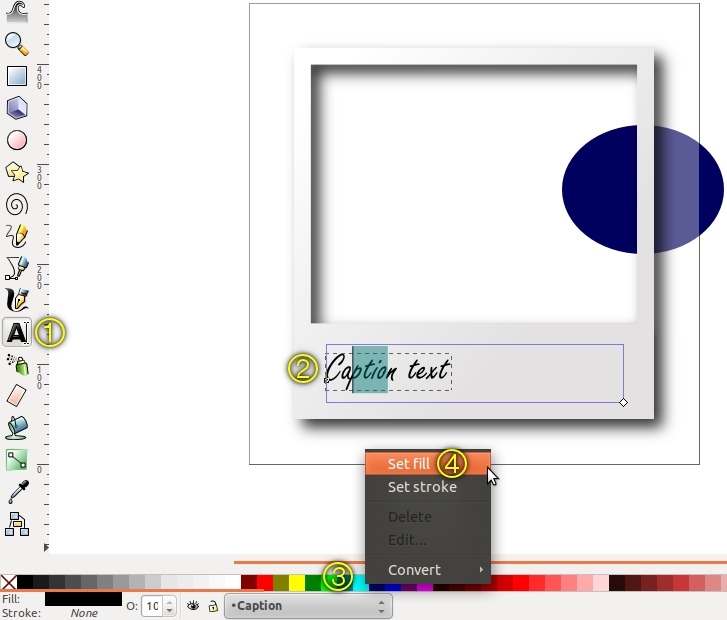 The Fill and Stroke (Shift+Ctrl+F) dialog, see Pic 23, will appear on the right-hand side of the Inkscape window. Referring to Pic 23, select the Fill tab, then click the Linear gradient icon. A horizontal line (we will get back to this line in Step 12) will appear in the center of Rectangle-1, see Pic 28. Click the Edit... button. The Gradient editor window will appear. See Pic 24. Pic 22 - Refer to Step 11.1. 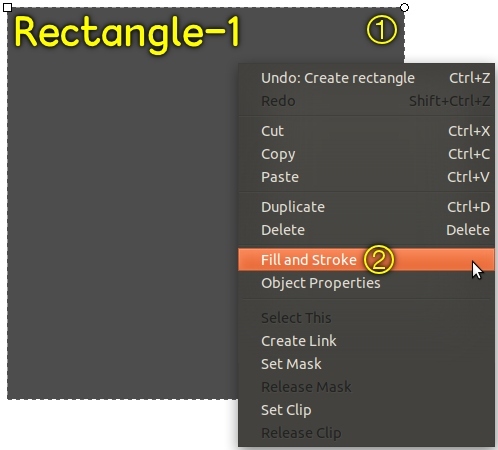 Accessing the fill and stroke properties of Rectangle-1. Rectangle-1 is the Polaroid frame. Pic 23 - Refer to Step 11.1. 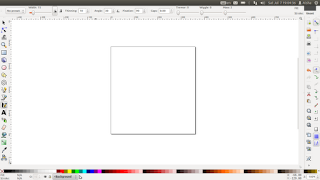 Accessing the Gradient editor window for Rectangle-1. 11.2. Creating the very light gray stop. e3e1e1 would be the hex (hexadecimal) color while ff would be the opacity (alpha). Then click the Add stop button. See Pic 24. Pic 24 - Refer to Step 11.2. Creating the light gray stop for Rectangle-1. 11.3. Creating the white stop. Then click the Add stop button. See Pic 25. Pic 25 - Refer to Step 11.3. Creating the white stop for Rectangle-1. 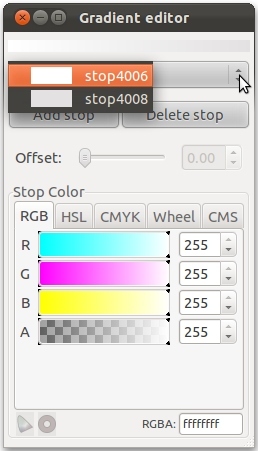 Still in the The Gradient editor window, check the drop-down menu for stops other than those mentioned in Step 11.2 and Step 11.3. To delete those extra stops, click that extra stop in the drop-down menu. Then click the Delete stop button. See Pic 26. You should have only two stops in the drop-down menu by the end of this step. See Pic 27. The Gradient editor window can be closed when done. Pic 26 - Refer to Step 11.4. Deleting extra stops in Rectangle-1. Pic 27 - Refer to Step 11.4. The two stops for Rectangle-1: the light gray and white stops. 11.5. Take note that we want the color to come from only the fill and that nothing comes from the stroke (outline). Go to the Stroke paint tab and make sure the No paint icon is selected. 12. About the horizontal line mentioned in Step 11, see Pic 28. If you don't see the line, make sure to select the Rectangle tool icon, see Pic 20, then click Rectangle-1. The horizontal line (gradient line?) is used to control the direction of the gradient. Move the handles and you move the direction of the gradient. Click-hold-drag the small square handle (start of linear gradient) of the horizontal line to the upper-left-hand side of the square. Click-hold-drag the small circle handle (end of linear gradient) of the horizontal line to the lower-right-hand side of the square. Pic 28 - Refer to Step 12. The horizontal line at the center of Rectangle-1 as mentioned in Step 11.1. The blue, circular shape you see in the screenshot is to demonstrate the opacity of the Polaroid frame. Pic 29 - Refer to Step 12. Shifting the direction of the gradient. 13. Creating the photo area. 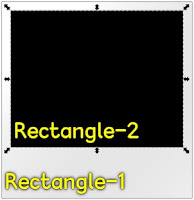 A new rectangle, namely Rectangle-2, will be created on top of Rectangle-1. See Pic 31. 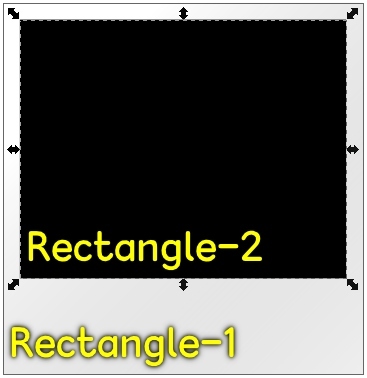 Using Rectangle-2 as a "cookie cutter", a hole will be cut out in Rectangle-1. The hole will be the photo area. 13.1. Click the Rectangle tool icon, see Pic 20. Create Rectangle-2 on top of Rectangle-1. Change the color of Rectangle-2 for better contrast if you need to. See Pic 31. Pic 30 - Refer to Step 13.1. The dimensions of Rectangle-2. Pic 31 - Refer to Step 13.1. Rectangle-2 is the "cookie cutter". Rectangle-1 is the Polaroid frame. The hole is the photo area. 13.2. Creating a hole the size of the photo area. press the Shift button to multiple-select. Go to Path > Difference. See Pic 32. A cut will be made instantaneously. See Pic 33. Pic 32 - Refer to Step 13.2. The photo area before the cut. Notice the presence of Rectangle-2. Pic 33 - Refer to Step 13.2. The photo area after the cut. Notice the absence of Rectangle-2. 14. Creating the drop shadow. 14.1. Take note that the Polaroid frame and the drop shadow will be automatically combined together permanently. It might be a good idea to make a duplicate of the Polaroid frame before proceeding further to avoid having to create the frame repeatedly. See Point D, Point E and Point F.
Right-click the Polaroid frame layer in the Layers (Shift+Ctrl+L) dialog. See Pic 34. 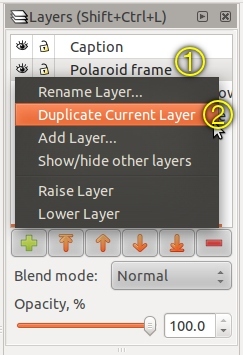 In the right-click menu select Duplicate Current Layer. A new layer with the word "copy" at the end of the name will be created. See Pic 38. Click the eye icon to show or hide the layer. An opened eye means the layer is visible. A closed eye means the layer is invisible. Click the padlock icon to lock or unlock the layer. An unlocked padlock means the layer is editable. A locked padlock means the layer is uneditable. Pic 34 - Refer to Step 14.1. 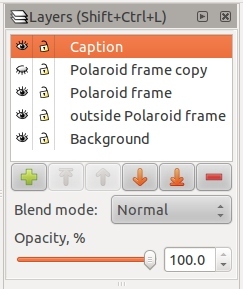 Duplicating the Polaroid frame layer. 14.2. 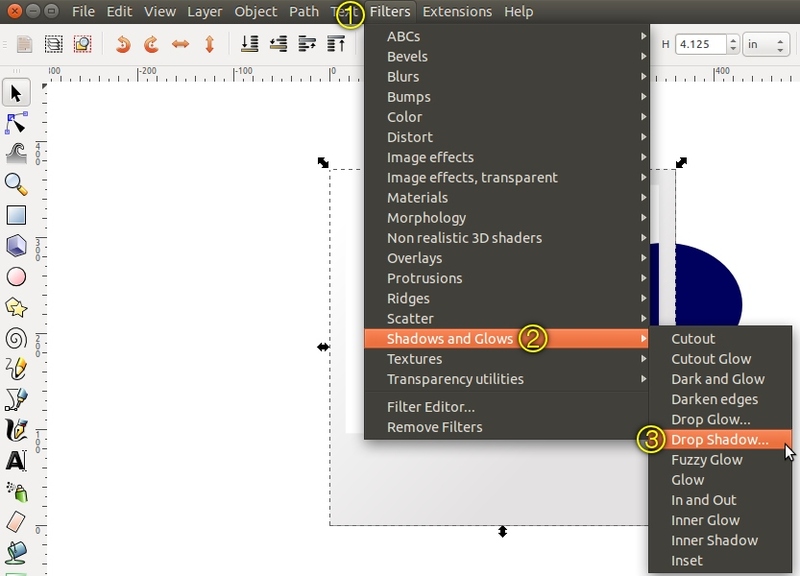 Go to Filters > Shadows and Glows > Drop Shadow... . See Pic 35. The Drop Shadow window will appear. See Pic 36. Put a tick in the Live preview box to see instantly the effect of the drop shadow settings. Then click the Apply button to apply the drop shadow effect. Pic 35 - Refer to Step 14.2. Accessing the Drop Shadow window. Pic 36 - Refer to Step 14.2. 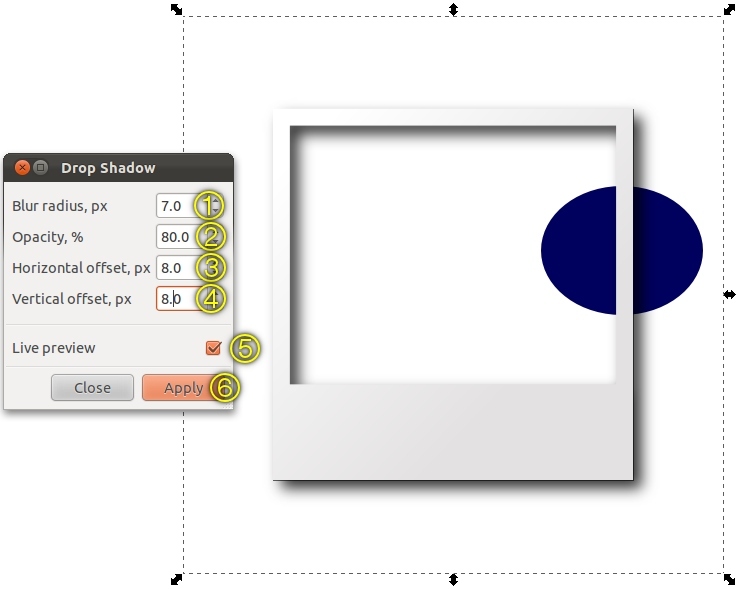 Dimensions of the drop shadow in the Drop Shadow window. 15. Creating the secondary frame (the frame outside the Polaroid frame). 15.1. Create a new layer for the secondary frame. See Step 10.1. 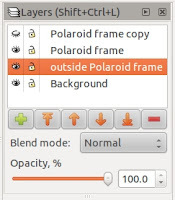 Name the layer as outside Polaroid frame in the Layer name field. Make sure the new layer is Below current in the Position field. 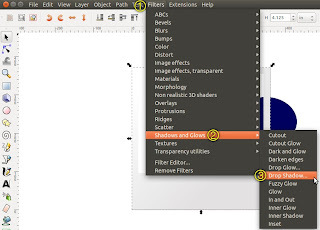 The layers can be rearranged by being raised or lowered using the buttons at the bottom of the Layers (Shift+Ctrl+L) dialog. Pic 37 - Refer to Step 15.1. Creating a new layer for the secondary frame. Pic 38 - Refer to Step 15.1. The layer arrangement in the Layers (Shift+Ctrl+L) dialog. 15.2. Create a new rectangle, namely Rectangle-3, on the outside Polaroid frame layer. Pic 39 - Refer to Step 15.2. The dimensions of Rectangle-3. 15.3. 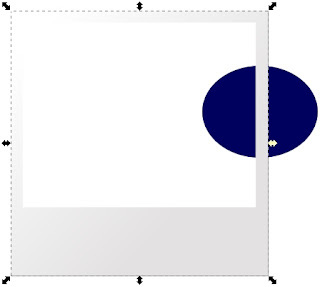 To center Rectangle-3 on the canvas, go to Object > Align and Distribute... . See Pic 40. 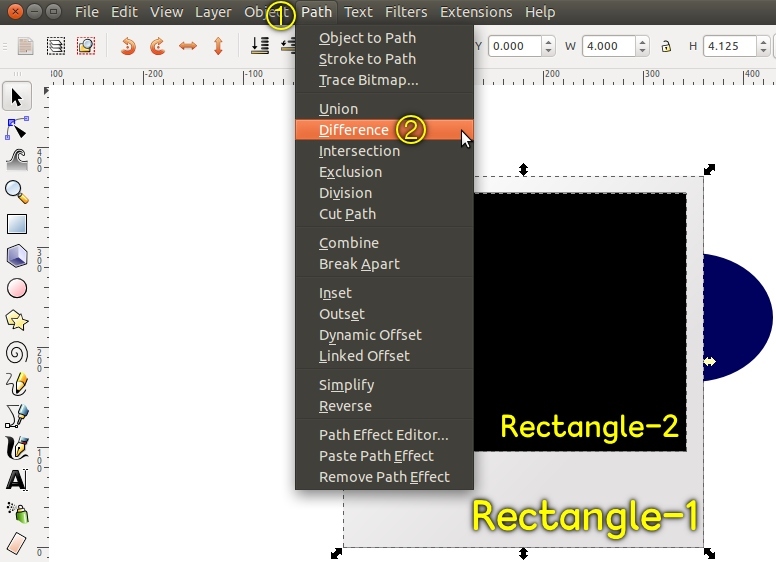 The Align and Distribute (Ctrl+Shift+A) dialog will appear on the right-hand side of the Inkscape window. Select everything on the canvas. Pic 40 - Refer to Step 15.3. Accessing the Align and Distribute (Ctrl+Shift+A) dialog. Pic 41 - Refer to Step 15.3. Aligned Rectangle-3 with the Polaroid frame and drop shadow. 15.4. Changing the color and opacity of Rectangle-3. Right-click Rectangle-3. In the right-click menu click the the Fill and Stroke. See Step 11 and Pic 22. In the Fill and Stroke (Ctrl+Shift+F) window, on the Fill tab, make sure to select the Flat color icon. See Pic 42. Pic 42 - Refer to Step 15.4. Giving Rectangle-3 the proper color and opacity. 15.5. The photo area needs to be cutout, again, this time for Rectangle-3. Simply repeat Step 13 because this step is similar to that step. Change the colors of Rectangle-2 for better contrast if you need to. Press the Shift button to multiple-select Rectangle-3 and Rectangle-2. By the end of this step the frame will look something like Pic 43. Pic 43 - Refer to Step 15.5. The photo area after the cut. 16. Enlarging the canvas to include Rectangle-3. Go to File > Document Properties... . See Pic 8. The Document Properties (Ctrl+Shift+D) window will appear. See Pic 44. On the Page tab, under the Custom size section, expand the Resize page to content... by clicking on the small triangle beside it. 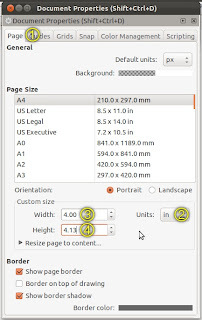 Click the Resize page to drawing or selection button. Close the Document Properties (Ctrl+Shift+D) window. Pic 44 - Refer to Step 16. 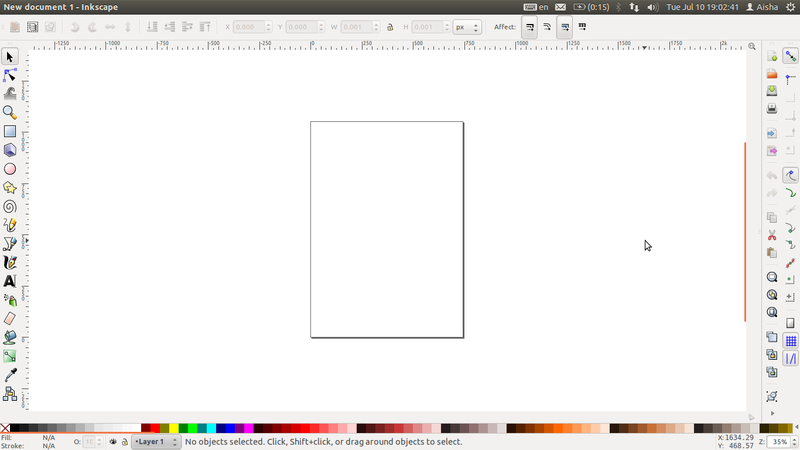 Resizing the canvas to accommodate Rectangle-3. 17.1. Just so we don't mess up anything in case something goes wrong, we will give the caption its very own layer. We will put the caption layer on the topmost of the layers. 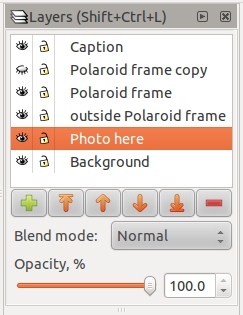 Click the Polaroid frame layer in the Layers (Shift+Ctrl+L) dialog. Then go to Layer > Add Layer... . See Pic 17. The Add Layer window will appear. The arrangement of layers in the Layers (Shift+Ctrl+L) dialog at the moment is shown in Pic 46. Pic 45 - Refer to Step 17.1. Creating a new layer for the caption. Pic 46 - Refer to Step 17.1. Current layer arrangement in the Layers (Shift+Ctrl+L) dialog. 17.2. To add the text, click the Text tool icon, see Pic 47, which is in the left-hand side toolbar. 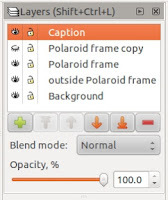 Click-hold-drag to create a text field in the lower part of the Polaroid frame. Update: 20 Syawal 1433H / 6 Sep 2012, Ju. The Controls bar will turn into the text-formatting toolbar where you can change the properties of the text. Type-in your text in the text field. Adjust the text properties (text field, text type, text size and text alignment) to your taste. To edit the text, you can also go to Text > Text and Font... . See Pic 49. The Text and Font (Ctrl+Shift+T) window will appear. See Pic 50. Pic 47 - Refer to Step 17.2. The Text tool icon. Pic 48 - Refer to Step 17.2. Properties of the caption text. Pic 49 - Refer to Step 17.2. 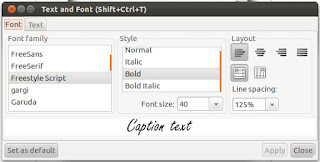 Accessing the Text and Font (Ctrl+Shift+T) window. Pic 50 - Refer to Step 17.2. 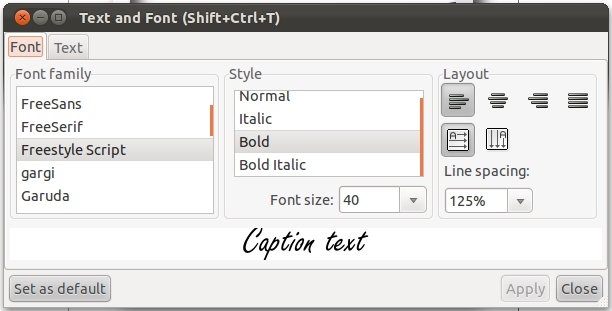 The Text and Font (Ctrl+Shift+T) window. 17.3. Changing the font color. (i) Using the Text tool, highlight the text. 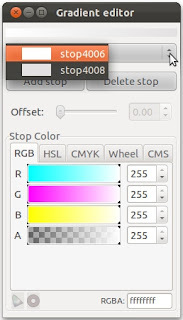 (ii) At the bottom of the Inkscape window, right-click the color you want then select Set fill. See Pic 51. If you want to give color to the outline of the text, select Set stroke instead. Pic 51 - Refer to Step 17.3. Changing the font color. You can also use the Fill and Stroke (Ctrl+Shift+F) dialog. See Pic 23. Go to the Fill tab to set the fill color. Go to the Stroke tab to set the outline color. 18. A layer specially for the photo. 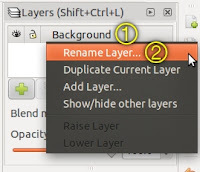 In the Layers (Ctrl+Shift+L) dialog, click the Background layer to activate it (make it the current layer). Then go to Layer > Add Layer... . See Pic 18. Pic 52 - Refer to Step 18. The Add Layer window for the Photo here layer. Pic 53 - Refer to Step 18. The final arrangement of the layers in the Layers (Ctrl+Shift+L) dialog. If you do not want an extra layer, you can rename the Background layer to Photo here layer instead. 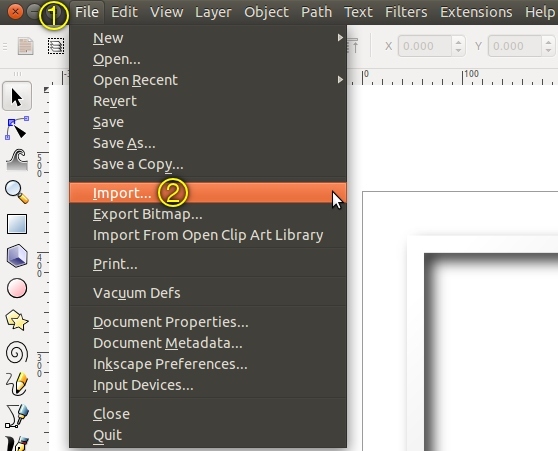 Simply click the layer's name in the Layers (Ctrl+Shift+L) dialog and rename. A.1. Click the Photo here layer in the Layers (Ctrl+Shift+L) dialog to activate it. A.2. Go to File > Import... . See Pic 54. The Select file to import window will appear. See Pic 55. In the window, locate the photo then click the Open button. Similarly you can simply drag-and-drop the photo onto the canvas. In my case, the jpeg GDK pixbuf Input window appeared. See Pic 56. Link or embed image: i chose embed. Then clicked the OK button. Depending on the photo size, the importing process might take a few minutes. Pic 54 - Refer to Point A. Accessing the Select file to import window. Pic 55 - Refer to Point A. The Select file to import window. Pic 56 - Refer to Point A. 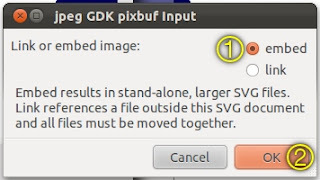 The jpeg GDK pixbuf Input window. A.3. Once the photo is on the canvas, to resize the photo proportionally, press the Ctrl button, then click-hold-drag one of the handles of the photo to resize. Pressing the Shift button will resize the photo along the axis corresponding to that particular handle. B. To edit the caption, click the Text tool icon then click the text field on the canvas. See Step 17.2. C. To save the file in another format (PNG). C.1. 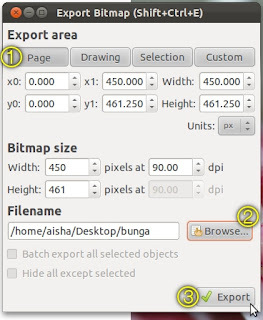 When you are done editing and ready to export your work, go to File > Export Bitmap... . See Pic 57. The Export Bitmap (Ctrl+Shift+E) window will appear. See Pic 58. Pic 57 - Refer to Point C.1. Accessing the Export Bitmap (Ctrl+Shift+E) window. (i) under the Export area section, click the Page button. See Pic 58. 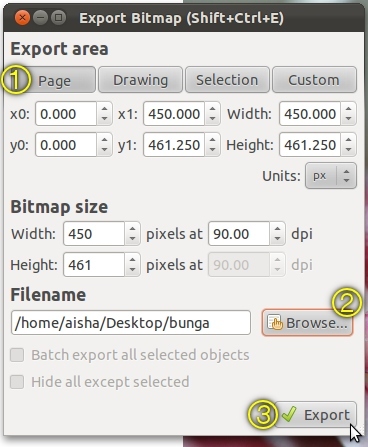 Page button -- exports according to the canvas size. Drawing button -- exports everything inside and outside the canvas area. Pic 58 - Refer to Point C.2. The Export Bitmap (Ctrl+Shift+E) window. 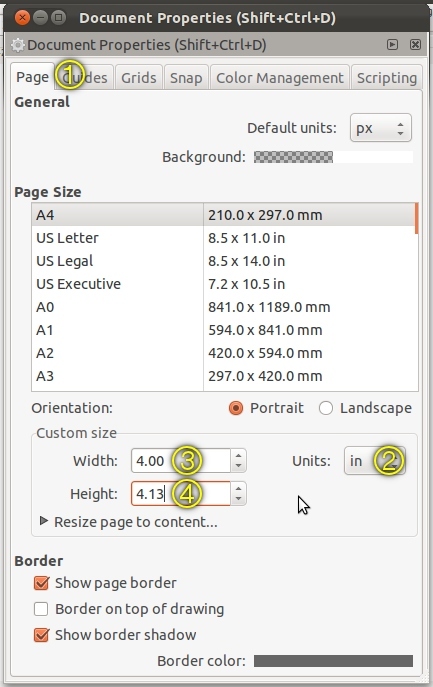 (ii) Under the Bitmap size section, increase or decrease the size of the resulting document if you need to. Otherwise proceed straight to Step C.2.iii. (iii) Under the Filename section, click the Browse button. See Pic 58. 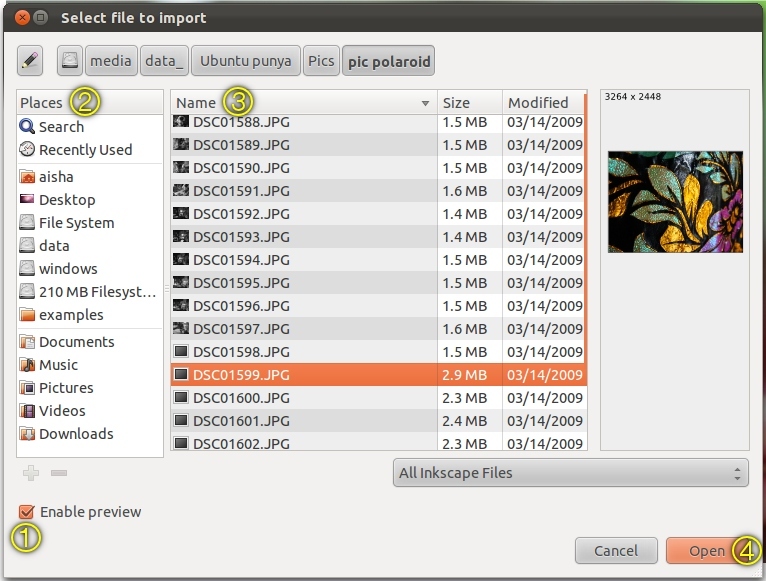 The Select a filename for exporting window will appear. See Pic 59. In the window, give the file a name and location. Then click the Save button. The window will disappear. Pic 59 - Refer to Step C.2.iii. The Select a filename for exporting window. (iv) Then click the Export button. See Pic 59. The file will be saved using the PNG format. D. To save the Polaroid frame + drop shadow + outside Polaroid frame. The result will look something like Pic 1.
are unlocked and visible. See Step 14.1. D.2. Then follow Step C.
In Step C.2.iii, click the Page button. E. To save the Polaroid frame + drop shadow -- outside Polaroid frame. The result will look something like Pic 2. E.2. Activate the Polaroid frame layer. On the canvas, select the Polaroid frame. E.3. Then follow Step C.
In Step C.2.iii, click the Selection button. F. To save the Polaroid frame -- drop shadow -- outside Polaroid frame. The result will look something like Pic 3. F.2. Activate the Polaroid frame copy layer. F.3. Then follow Step C.